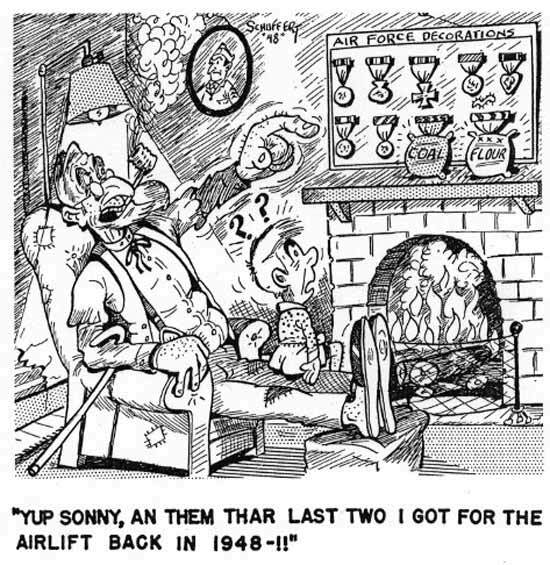 Cartoons produced by members of the aircrews helped to alleviate the stress. Image by: Jake Schuffert. Source: Truman Library and Museum. The three prongs on the monument represent the three air corridors used during the Airlift. Image Source: Wikimedia Commons. There were 101 fatalities recorded during the Airlift. The number includes 40 British and 31 American servicemen. The majority died as a result of accidents resulting from hazardous weather conditions or mechanical failures. The remainder is composed of civilians who perished on the ground while providing support for the operation or who lost their lives when aircraft accidents destroyed their homes. 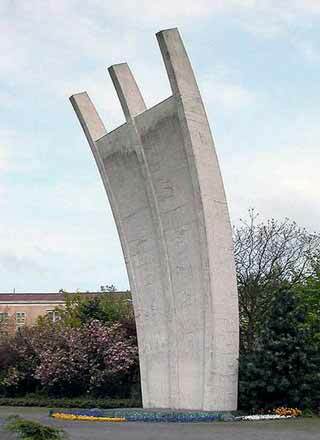 In honor of the pilots and aircrews who were lost the Berlin Airlift Monument was created from a fund established by the former Federal Republic of Germany and private donations. It was dedicated in 1951. All together there are three matching monuments: at Rhein-Main Air Base near Frankfurt, at Wietzenbruch near the former British airbase Celle, and at the Luftbruckenplatz (Airbridge Place) Berlin-Tempelhof airfield. The base of the monument at Tempelhof reads, "They gave their lives for the freedom of Berlin in service for the Berlin Airlift 1984/1949." The location at Tempelhof is presently being considered as a UNESCO World Heritage site. The Candy Bomber received many of his supplies from sympathetic groups in the United States. Image Source: Wikimedia Commons. 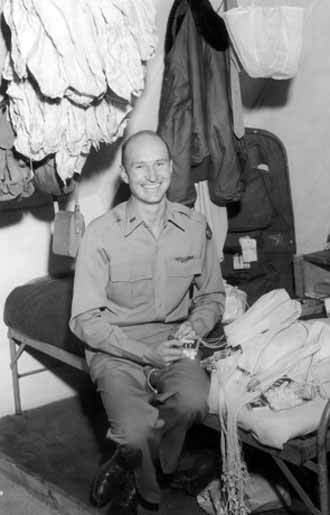 He was known variously as the Candy Bomber, Uncle Wiggly Wings, the Chocolate Uncle, and the Chocolate Flier, but US Air Force Lieutenant Gail Halvorsen captured the hearts of Berlin's children by staging his own Operation "Little Vittles." During the height of the Airlift Halvorsen began dropping small parachutes containing gifts of chewing gum, chocolate bars, and assorted candies down to waving throngs of West Berlin children as his aircraft would pass overhead. He began this in response to an earlier visit with some of the children who were stoically enduring the deprivations of the Soviet blockade. Glad to receive any food or even some coal, they became ecstatic when they received just a small bit of candy, a rare commodity. Appreciating their dilemma Halvorsen responded in an effort to boost their morale. The gesture worked and has never been forgotten. Operation "Little Vittles" continued for the duration of the Airlift and was joined in by other pilots and aircrews. The last award of this medal was made on 30 September 1949. It is now obsolete. Image Source: Wikimedia Commons. Participation in the Airlift was recognized through a special act of Congress on 20 July 1949 that granted the minting and awarding of the Medal for Humane Action to members of the US Army, Airforce, and Navy who served in support for at least 120 days during the period 26 June 1949 through 30 September 1949. The citation reads "For humane action to supply necessities of life to the people of Berlin, German." Wearing of a small bronze C-54 aircraft device on the military Occupation Medal was also authorized for wear by the three services in recognition of service during the same period. 1D.M. Giangreco and R.E. Griffin, "Airbridge to Berlin: The Berlin Crisis of 1948," 1988, 20 April 2010 <http: www.trumanlibrary.org/whistlestop/berlin_4/blockade.htm>.